It's always great to arrive at Bryce and always a little sad to leave. But there will be a "next time" and we're already looking forward to it. 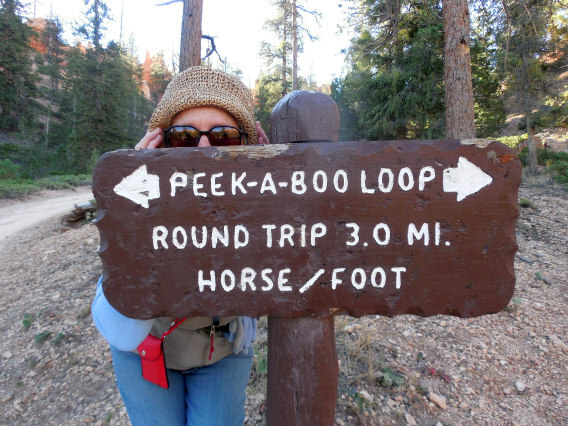 As we've mentioned, the NPS is closing Sunset Campground tomorrow-October 20 so, we its time to move down the road. Sunday was our best day at Bryce for this visit. Incredibly deep blue bird skies, no wind, temps in the low 60's. We hit the trails early and there was no one on the Navajo switchbacks. As we made our way down those finely tuned switchbacks, a solo hiker appeared. She was a young Japanese woman with a sparkling smile. Susun offered to take her photo with the woman's camera. She was so delighted. After Susun took her picture, the young woman gave Susun the most wonderful hug and held Susun's hands and beamed a hugely bright smile into Susun's face. 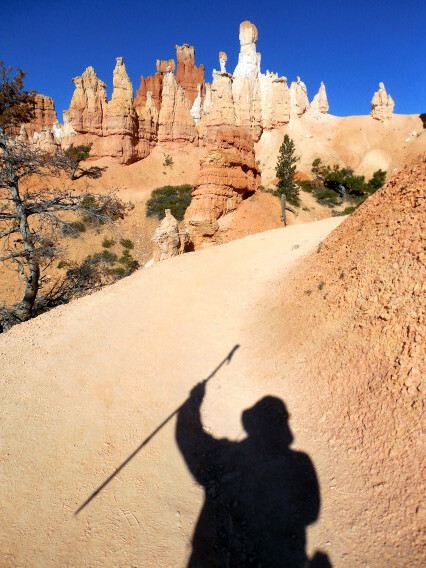 It was a perfect way to begin a perfect day on the Magical Mystery Tour of Bryce Canyon's fabled trails. We made a short video about "going to Church" at Bryce. It's too big a file to post from the Lodge lame Wifi. We will post it when we get a faster connection. After almost 5 hours in Hoodoo Heaven, we made our way back to camp for lunch. Then we went to enjoy hot showers. Yep, Bryce has that, too, and for only $2 a person. Your two bucks buys eight minutes of wonderfully hot water. After the showers, it was off to the Visitor Center to get the promised "small reward" for bagging benchmarks along the trails. We were both delighted to see the so-called "small reward" was a great looking pin. Now, we're at the Lodge for our last visit here. Tomorrow, we'll pack up and pull out sometime by mid-morning. It's been yet another great Bryce visit.